The Regional Roaming Agreement was signed today in Belgrade during the Western Balkans Digital Summit. The Agreement will lower the roaming charges as of 1 July 2019, while as of mid-2021 it will even roaming traffic charges with those of the domestic traffic. European Commissioner for Digital Economy and Society Mariya Gabriel said that the Agreement will bring substantial benefits to both individuals and entities. “Let me be entirely clear: this Agreement is yours, not ours. We have been fully supporting this process from the beginning. Today’s signature of the Agreement shows a strong political will to bring about a bold digital integration. I am truly thankful to everyone who have taken their time and energy in the political sense of the word to make this Agreement possible,“ the Commissioner said. Announcing the commencement of the work on abolishing roaming charges between the region and EU countries, Gabriel commended the efforts taken by the Western Balkans governments, saying that they are a solid basis for the development of vigorous economies, connectivity within the region and its European path. She also said that much progress has been achieved since the first Western Balkans Digital Summit, held in Skopje in 2018. 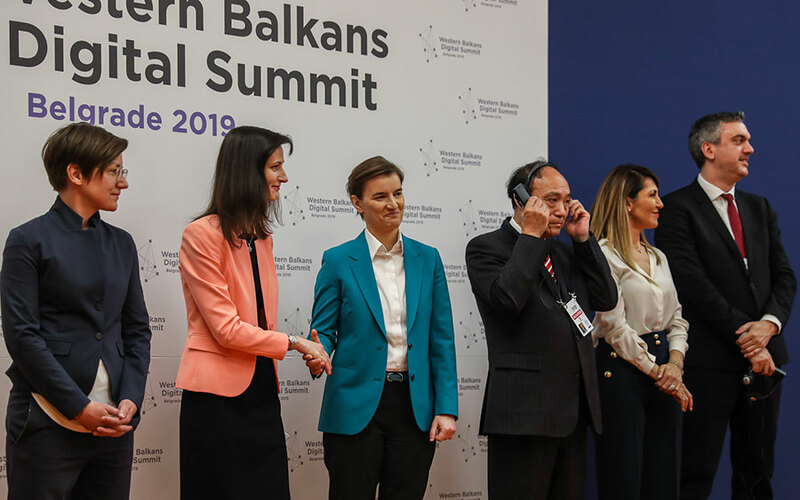 Serbian Prime Minister Ana Brnabic described the Summit as important as it shows that the Western Balkans region keeps up with the times and trends, adding that the world is currently going through the fourth technological revolution, offering the Western Balkans region a chance to catch up. “I would like to thank our friends in the European Union and European Commission, above all Commissioner Gabriel and her team, for their effort, support and understanding. Also, I would like to thank others who have been supportive not only of Belgrade, but also of Serbia and the entire region of Western Balkans on this hard, bumpy and challenging journey that can set an entirely different – and better – course for us,“ Brnabic said. On behalf of Serbia, the Agreement was also signed by Minister of Trade, Tourism and Telecommunications Rasim Ljajic. Under the first stage – which kicks off on 1 July – roaming tariffs will be reduced by 27%, while as of 1 July 2021, all roaming charges in the Western Balkans countries will be abolished. The Agreement sets out the maximum price of RSD22.4 for a minute of conversation; RSD7 for an SMS; whereas the price of data transfer per megabyte will not exceed RSD21.2. All prices are excluding VAT. Roaming charges in Albania will be reduced by 85% as the country has not until now been part of another agreement signed by Serbia, Montenegro, North Macedonia and Bosnia and Herzegovina in 2014. The two-day Western Balkans Digital Summit is taking place in the Palace of Serbia, bringing together over 3,000 participants to take regional digital cooperation to the next level. Among the participants are numerous government and business community representatives who will discuss innovative approaches, showcase cutting-edge technologies and share ideas.